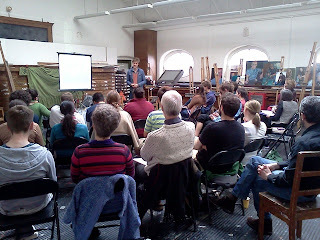 Almost a month ago now we held the second Interface Arts Day in Wales. In comparison to the work of Interface which has been going for many, many years- in Scotland and in London - Wales is only just beginning its exciting journey to develop work with its Christian artists; encourage students across Wales to really engage with their subject area, think critically about the contemporary art world, where their work fits in, pursue excellence in their work and think through and question what it means to be an artist and a Christian and how we can engage intelligently with the dialogues taking place in the contemporary art world. This year the Interface day moved from Cardiff to Aberystwyth and took place in the University’s School of Art. It was fantastic to have the entire School of Art to ourselves; which is a beautiful and intriguing building full of lots of exciting art work. A big thank you must be said to the wonderful porters who work at the School of Art; who are always smiling and willing to help with all of our strange requests and who put up with our crazy and loud improvised drama which we created around the School of Art and right outside the porter’s office. We were joined for the day by the Morphe team; Ally Gordon, Cully, Lois Adams and Ed Mayhew. It was such a blessing to have them with us; they brought with them bundles of joy, enthusiasm and wisdom, which was very contagious. Ally spoke in the morning on the task of the Christian artist today, followed two seminars entitled, ‘World Cinema Meets The Ten Commandments’, ‘Satire and the Written and Spoken Word’ alongside a gallery visit to the Aberystwyth Arts Centre, and a Q and A session with Ally. We were joined by artists young and old and from all disciplines. There were students from Bangor, Wrexham, Aberystwyth and Cardiff Universities. There was even a mini-reunion between three very special people who used to work for UCCF and help with the Christian arts work in Wales; John Harvey, Anne Brown and Rhiain Davies. John is a well respected professor of art at the school in Aberystwyth, Rhiain is a very talented professional illustrator and Anne specialises in History of Art and speaks at many events across the world. Now, one thing I learnt very well on the Interface day was that however much planning you do, things can still go wrong, that’s when you improvise; which is exactly what we did! The evening entertainment turned into an incredible time of hilarious, thought-provoking, inspiring and strange sharing of work. Led by Ed Mayhew – who rightly pointed out that we can learn just as much through doing as through listening - the entire group proceeded to navigate their way through the school of art, together acting out and developing a story of murder, addiction, mystery, love and something to do with scarves! We ended up in the gallery space downstairs and closed the evening with a wonderful time of performance by Rhodri Brady (monologue), Ben Cribbin (poetry), Ed Mayhew (comedy through music! ), Ian Ho (jazz piano) and Sarah White – that’s me - (dance). Oh plus some spontaneous flamenco dancing from Dan Meiring (Aberystwyth staff worker) and Lois Adams. All in all it was a wonderful, joy filled day which was such an encouragement and a thrill to be a part of, personally I can’t wait till next year!